October 13 2007 marks the formal winding up of the Irish Political Prisoners Children’s Holiday (IPPCH) programme, after 26 years in operation. The Programme was founded in 1981 to alleviate the suffering of those children who had been affected by the political imprisonment of a family member. 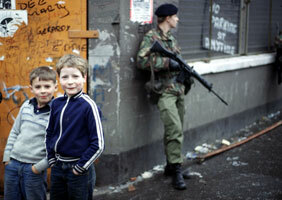 The programme began with two children, in 1981, who were selected by serving republican prisoners. To date, an estimated 5,000 children have benefited from taking part on the four-week holiday programme. The programme was made possible by the generous donations and the fundraising work of many IPPCH committees in the US. Children were placed with families, and provided with a valuable break from the conflict in Ireland. Many children have forged life long friendships with their host families and continue to return to the US each summer. The work of the IPPCH and those who helped co-ordinate and work for the programme will be celebrated on 13 October 2007, at a celebration function in the Balmoral Hotel, Belfast at 8pm. The event is FREE, and organised by Tar Anall. Over 20 US organisers are expected to be in Belfast for the formal closing of the IPPCH programme, which has been administered by Tar Anall, at the final AGM, and they will be in attendance at the evening function. Tar Anall is calling for all those who have participated in the programme, or have worked on the programme, or have sent their children on the programme to come along to the Balmoral Hotel, on 13 October, to show their appreciation and gratitude to the organisers of the IPPCH over the years. Tar Anall is particularly interested in hearing about memories of the programme, from those that participated over the last 26 years, and any photographs that could be used as part of an exhibit would be welcomed. Invitations are open, and no tickets are required.